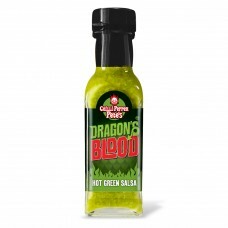 What can we say of the legend that is Chilli Pepper Pete's Dragon's Blood Hot Green Salsa? A delicious green sauce with a bit of a bite and a whole lot of zing! A generous splash on your food puts the zest back into any mealtime! Perfect as a dipping sauce with nachos, or as a dressing for salad - just set your imagination free!